Monday 9th July, ODEON Cinema. Start time: 8:00 p.m.
Cert. PG, 99 mins. In French with English subtitles, 1959. 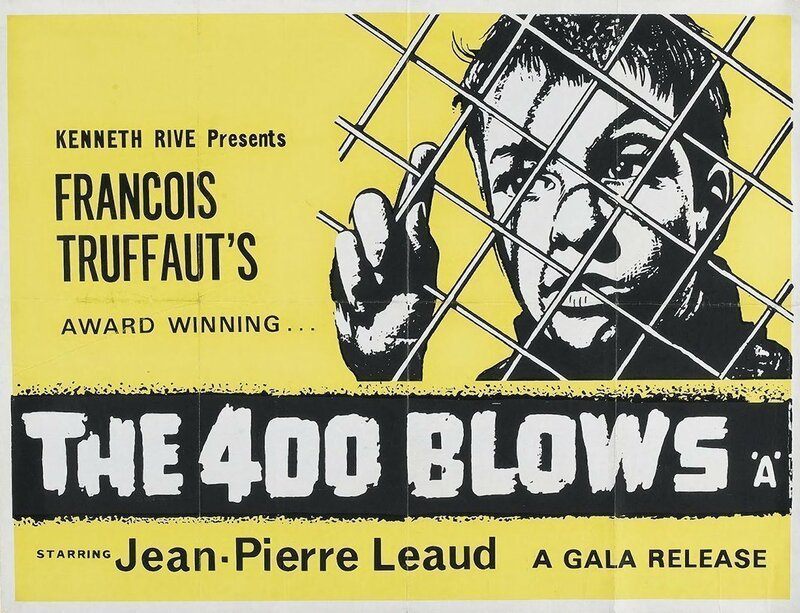 The 400 Blows, original French title, Les Quatre Cents Coups, is French film director Francois Truffaut’s first feature film. Truffaut is one of the major French and European Film Directors of the second half of the 20th Century and is one of that group of French film directors which emerged after the Second World War in what became known as the French New Wave. Amongst others in this group were Claude Chabrol, Jean Luc-Godard and Eric Rohmer. These people had started off as Film Critics. There, in that role, they had argued the case for a personal cinema, that is, a cinema where the director is the creative driving force of a film, the one who gives it its artistic identity, rather than being merely a hired contractor working only with other peoples’ ideas and creations. And by the end of the 1950s, these guys had moved on from writing about films to directing them. Truffaut’s first venture on to the big screen was in 1958 with his short film, Les Mistons. Made the next year, The 400 Blows was Truffaut’s first major film and was selected as an official French entry for that year’s Cannes Film Festival. There, it was very well received and Truffaut won the award for Best Director. The film became an enormous success all over the world and was the launching pad for his subsequent career. After The 400 Blows, Truffaut had a long and successful career for the next quarter-century. He made over 20 films and worked continuously as a director until his death in 1984. In this film, The 400 Blows Truffaut zeroes in on the life of a 13 year-old, Antoine Doinel, played by a young Jean-Pierre Leaud. Antoine lives in a cramped apartment in Paris (not the fashionable bit) with his mother and stepfather. It’s not a happy relationship. His mother is resentful of a child she had not wanted, and is alternately loving and cruel. She is insensitive and uncaring of his needs. His stepfather will spend time with him but lacks patience. From this, it is not surprising that Antoine’s life is reasonably chaotic and dysfunctional and this is mirrored in his adventures and misadventures and in what happens to him. This film was not just a single, one-off, focus into the territory of adolescence. Alongside and in addition to, the many other films he made, Truffaut continued to follow his protégé Antoine in the ups and downs of his life, for the next 20 years through 4 more films. So, you might well say that not only is this film a beginning for the lead character on the screen, it’s also a beginning for the person behind the camera. Whatever nerve it touched in Truffaut – and clearly it did touch a nerve – it took him until 1979 to work it through – if indeed he ever did work it through. Perhaps Film Directors are just like the rest of us, simply human. Let’s watch the film and make our own judgement. Thank you for listening so kindly. Just under half the audience filled in a feedback form. There was one response of 3 with the remainder being 4s and 5s, with the 4s having a few more than the 5s. The 3 response enjoyed the fact that the film told a story and highlighted the Parisian street scenes. These elements of the film, especially the urban locations, were picked up by a number of respondents. This respondent was especially delighted by the Punch and Judy show, “- the look on the children’s faces was worth the entrance fee”. A number of responses made specific note of when the film was made, 1959. One person commented, “A dated film but well done and a good indicator of an old fashioned era that is best forgotten…”. Whilst accepting when it was made, others took a wider social view, “Evoked the 50s era and poor working class conditions”, “a great period piece – but of its time!” and “A very difficult subject – of its time and superb film making – sad and yet had humour – tear jerking”. The central performance, by teenage lead actor Jean-Pierre Leaud, was hit upon by several people, “A spirited and loving boy whose taste for life is catching! Bravo Truffaut!”, “A superb young actor – so natural. Really pulled at the heart strings” and (poignantly) “I hope he finds his way”. All in all, the film seemed to strike a chord with many in the audience such that there was a feeling expressed for more, if not of the same, certainly for more of the similar. Such comments ran from the straightforward, “More foreign films please” to the “So charming! I loved it, more of them please” and the entirely current “With Brexit we need more French films”. Monday 11th June, ODEON Cinema. Start time: 8:00 p.m.
Cert. 15, 130 mins. 2017. 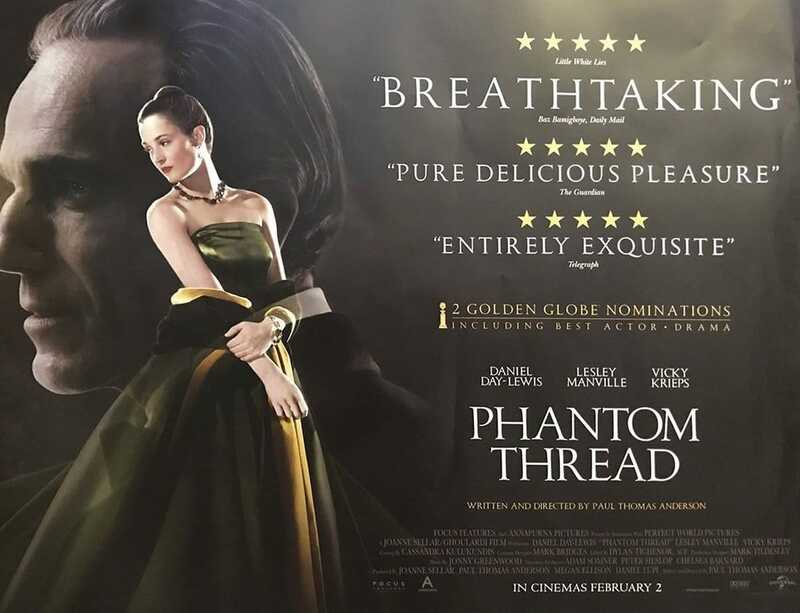 The title: Phantom Thread, apparently refers to when seamstresses working in East End of Victorian London would describe the sensation of their hands moving involuntarily, repeating the movements that they’d performed all day for hours and hours in the workshop after returning home and its these elements that help to inform our viewing of tonight’s film. Daniel Day-Lewis’ character is indicative of this obsessive, unconscious behaviour. So devoted is he to the craft of dress-making that it dominates every aspect of day-to-day life at the House of Woodcock and all of this creative energy and focus is expertly managed by his sister, Cyril, played by Lesley Manville so that everything within his immediate environment is ‘just so’. Though in the high-pressure world of haute couture control and chaos are near neighbours. The film, in amongst all of its finery has the feeling of a gothic romance, it never feels far away from having one of the characters glide around the home, and place of work, with a lit candle lighting the landing. This is intentional by the director, Paul Thomas Anderson, who had wanted to explore the genre for a very long time. To read this film it’s helpful to have a knowledge of Jane Eyre or Rebecca or in terms of purely cinema Gaslight or Dragonwyck ie., our female protagonist, tonight it’s Alma, is brought to a location willingly before realising that all might not be what it seems and witness how she learns to adapt to this unfamiliar landscape. This film draws upon all of this influences but also goes a step further in examining class, appearance and behaviour as we watch the subtle yet momentous transitions of power, influence and control in the buttoned-up London of the 1950s. Day-Lewis, as we all know, can dominate a film by his mere presence but even he was unsettled by Vicky Krieps’ relaxed portrayal as Alma and how her easy-going charm belied an inner strength and resolve that no-one expected…. Between a third and a half of the audience filled in and returned a Feedback form. With one 2 score marked, the rest were scored from 3 to 5, with the 4 scores totalling more than both the 3 and 5 scores combined. The 2 score comment described it as, “a weird film! Not very likeable characters – good acting but a bit too much on manipulation!” Each of the distinct elements of this comment was picked up by individuals in their personal comments throughout the feedback. Monday 14th May, ODEON Cinema. Start time: 8:00 p.m.
Cert. 12A, 107 mins. 2017. Robert Cedric Sherriff decided to apply to serve as an officer when the First World War broke out shortly after he had just joined the Sun Assurance Company in London after leaving school. He was 18 years old. He later recalled: “I was excited, enthusiastic. It would be far more interesting to be an officer than a man in the ranks. An officer, I realised, had to be a bit above the others, but I had had a sound education at the grammar school and could speak good English.” However, the army was not impressed with his Kingston Grammar School education and his application was rejected. Sherriff returned to his job, however, by the following year, the Army had lost so many junior officers that it decided to lower its standards. In November 1915, he volunteered again and was granted a commission in the East Surrey Regiment. He arrived on the front-line of the Western Front on 7th October 1916 and over the next four months he served at Vimy and Messines Ridges. During his active service Sherriff mentioned suffering bouts of neuralgia in letters to his parents, and he would later create the character of Hibbert in Journey’s End and have him suffer from the same condition. As the battalion advanced towards the German front-line a shell exploded on top of a pill-box and he was injured for a second time. He later recalled that “with the aid of probes and tweezers, a doctor took fifty-two pieces of concrete out of me.” He was sent back to England to recuperate then joined the Home Service and was demobbed in 1919. Returning to work as an insurance adjuster he wrote plays in his spare-time, often as a means to raise funds for local causes before progressing to professional productions. Journey’s End was first performed in 1928 by the Incorporated Stage Society, ISS, a private group who put on “plays of merit” on Sunday evenings, when other theatres were dark. They were not wholly convinced but agreed to go ahead, giving the play its premiere on 9th December 1928, with Laurence Olivier in the role of the young officer, Stanhope. A producer named Maurice Browne took the initiative and the play received its full West End premiere in the Savoy Theatre on 21st January 1929 and played to packed houses for two years. The success of Journey’s End also opened up a lucrative career as a screenwriter for Sherriff through his contact with James Whale, who directed the play. Whale went to Hollywood, and quickly made a reputation with films such as Frankenstein. He called on Sherriff to write the script for The Invisible Man, and became a major figure in screenwriting. He also wrote scripts for Goodbye Mr Chips (1939, for which he was nominated for his only Oscar), The Four Feathers, Lady Hamilton, Quartet, The Night My Number Came Up and even The Dam Busters. He died in Kingston Hospital on 13th November, 1975. Just under a third of the audience filled in and returned a Feedback form. Of those responses returned, there was a unanimity in both marking and sentiment that was very striking. All scores given were either 4s or 5s. A few individuals had submitted responses with written comments but no numerical score. However, from those comments, “Excellent”, “Difficult to mark, an anti-war film – par excellence. We never learn”, it can be assumed that scoring would have been towards the higher end of the scale. Overall, the film was felt to be very powerful (with this term or equivalent used several times in written comments) and to have captured not only the general brutalism of war but in particular that specific visceral and de-humanising nature of the WW1 trench experience. Comments on these lines were “Very realistic, too much so”, “Performances by the actors really captured the mental anguish the First World War induced”, “The horror of WW1 was in the cinema. Horrendous, but so moving & authentic” and “Almost unbearable to watch”. Whilst most responses centred solely on the story and its setting as told in the film itself, some individuals picked up specifically on its cultural echoes and technical aspects. One person caveated, “Atmospheric and convincing portrayal – not especially original though (or maybe the story has been retold too many times)”. Another person felt the film had been populated by “stock characters for the most part”. One individual was drawn to how the film had been shot, “Pretty damn good, the camera unleashed”. 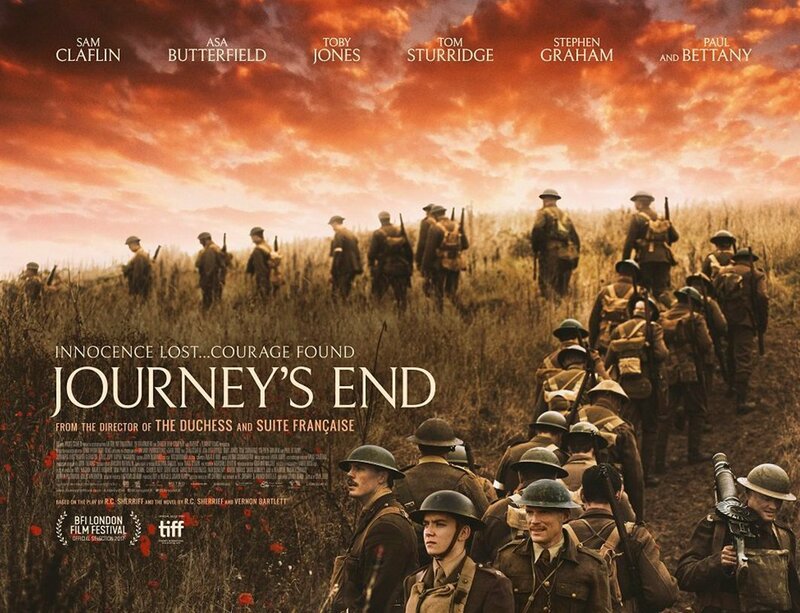 In summary, having watched Journey’s End, those in the audience were not left indifferent by the experience. Monday 9th April, ODEON Cinema. Start time: 8:00 p.m.
Cert. 12A, 105 mins. In Italian with English subtitles, 1945. 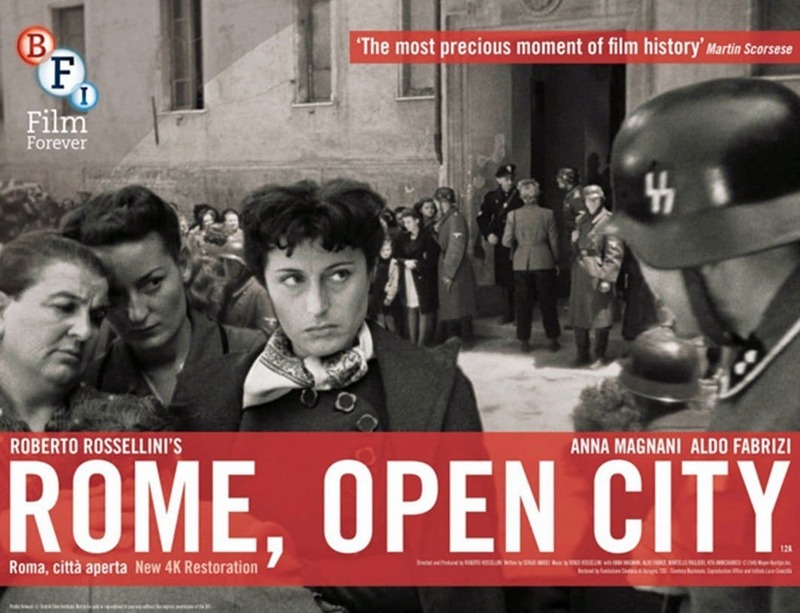 Rome, Open City is a film that is raw and bleeding and not just at the edges. It couldn’t be anything else. It was made in the immediate aftermath of the Second World War, in Italy, and has all the passion that you would expect from this circumstance. Directed by Roberto Rossellini, the story itself takes place in wartime Rome, just a bit before the city’s liberation in early June of 1943. It depicts the iron hand of the Italian Fascist and German authorities on the population – and – the courage of those Italians who resisted and fought back. And yet, this film is also a beginning. It marks the start of what came to be called the Italian neo-realist movement of the late 1940s and early 1950s. Films associated with this period have the same hallmarks of real street locations and what was then the current social reality of the moment. And the influence of Italian neo-realism has never gone away in cinema. Think Bladerunner (either version) – but cleaned up with no grime or gunge. It just wouldn’t work. The 4 scores noted the power of the film with comments such as, “gritty”, “powerful” and “painful to watch” being typical of the responses in both the 4 and 5 rankings. One respondent noted and was pleasantly surprised by the moments of humour in the film. Many 5 score respondents admitted it was a difficult watch but recognised the sheer power it exuded. One person stated, “it showed the power of cinema to record the brutality of war and the power of the resistance”. This sentiment was repeated in many comments. “A brave film, had to be made”, “Brilliant”, “Very moving”, “Film was exceptional (…) Acting was amazing. Cut deep and really made you think” are representative of what was written. For one individual, the film carried a personal meaning, “Very moving. My father was in Italy at that time”. And for another individual the Club ranking of a top score of 5 wasn’t enough. They regarded it as “Very hard hitting” especially for when it was made, found it very technically accomplished and decided it deserved a 6. Monday 12th March, ODEON Cinema. Start time: 8:00 p.m.
Cert. 15, 106 mins. 2017. The start of the story of this film, which is based on real events goes back to the 40s & 50s when I was still in short trousers and sneaking into ‘X’ rated films via the fire exit or trying to con adults to take me into ‘A’ rated ones. In these days of fly on the wall documentaries and reality TV, the word ‘Star’ has become somewhat debased. Back in those days it meant very much what it said on the tin and Gloria Grahame, whose real name was Gloria Hallward was a true Film Star, She played a leading role in Blond Fever in 1944 when she was only 21 and then in It’s A Wonderful Life in 1946. In 1950 she played the lead in In a Lonely Place, following that with an Oscar in 1952 as Best Supporting Actress in The Bad and the Beautiful. In the 50s and 60s she became a stalwart in many Film Noir films as a femme fatal. Without being too much of a spoiler this biographical drama, is the true story of the latter part of her life. The original biography was written as a memoir in 1984 by Peter Turner a close friend of Gloria’s who met her in London in 1978, when he was 26 and she was 55. In the 40s & 50s Hollywood sexist bullying, combined with both mental and physical abuse was probably was far worse than recent allegations which have received much publicity, and it has been widely reported that Gloria Graham was very insecure as a person, no matter how strong and individual she came across in her film roles and there is no doubt that she was a very fragile person when she first met Peter Turner. Today their relationship may be given a different description, but I will just say they were very close friends. At the time he hoped the memoir would be made into a film but that took 3 decades to happen. This could have been yet another film that never got made, but for Barbara Broccoli, well known as a James Bond producer and one of the co-producers of this film, who knew Turner back when he was in the same digs as Grahame in Primrose Hill. After he wrote the memoir he gave her the manuscript which she thought was beautiful. David Puttnam of Columbia Studios originally optioned the book but the project went into turnaround after he left the studio. 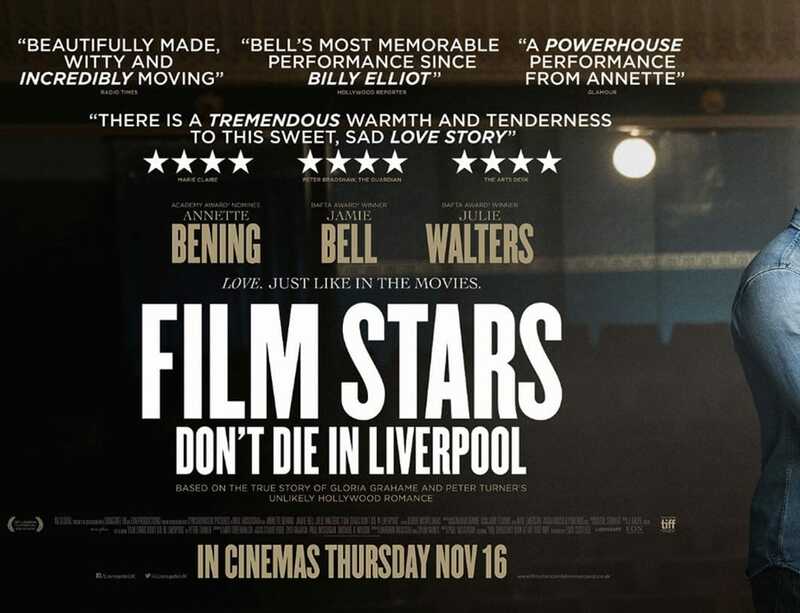 Others tried to make it, from Joan Collins, Madonna, and Barbara Hershey to Liverpudlians Ian Hart and David Morrissey. During production, a chance visit by Broccoli & Turner to the London Palladium to see Elvis Costello’s show resulted in Costello, a huge Gloria Graham fan, writing & performing the closing song You Shouldn’t Look at Me That Way. Peter Turner, now aged 66, stayed in the profession, acting, writing and directing and actually plays the role of Jack in the film. The film, which was nominated for 3 BAFTA’s, is directed by Paul McGuigan, with Annette Bening playing Gloria Grahame and Jamie Belle playing Peter Turner. Oscar nominee Julie Walters plays Bella Turner and Oscar winner Vanessa Redgrave plays Jeanne McDougall. A final bit of film trivia is that this is only the third non-Bond film to come from Eon Productions, the other two being Call Me Bwana & Chitty Chitty Bang Bang, both from back in the 60s. So how does it all actually end? I don’t know so I can’t spoil it for you, but the title might give us a hint. Just over half the audience filled in and returned a Feedback form. There were 5 responses with a score of 3. All other comments had a 4 and 5 ranking with the 5 scores being 60% of that total. Comments from those giving a 3 score were “OK Film. Good main performances” and “enjoyable but rather slow”. The pacing was also noted by some individual respondents allocating a 4 score, “Excellent – bit drawn out in some scenes” and “A film in 2 parts, took time to build, 1st part not convinced by totally but built to something profoundly moving”. There were many comments praising the performances of the two lead characters. Jamie Bell who played Peter as Gloria Grahame’s lover was singled out for specific mention. Typically of these comments were “Beautifully portrayed. Jamie Bell was brilliant. A really lovely portrayal” and “Jamie Bell was excellent”. Although Annette Bening’s performance as Gloria did not attract named personal comments, it was clear from responses that both lead actors were felt to have had produced stand-out performances. “Very moving. Great performances from both leads” and “Wonderful film and for the acting – very moving” are representative of the comments. One person did note [of Gloria Grahame] “she was a lovely lady and a good actress”. As a whole the film and the story it told did resonate emotionally with the audience. “heart-breaking”, “A very moving love story”, “Poignant. Emotional. Felt enriched by having watched it” were among comments returned. One comment summed up the evening’s experience, “One of the best films I have ever seen (…) one to remember forever”. Monday 12th February, ODEON Cinema. Start time: 8:00 p.m.
Cert. 12, 95 mins. 2017. Tonight’s film is if nothing else a technical achievement. 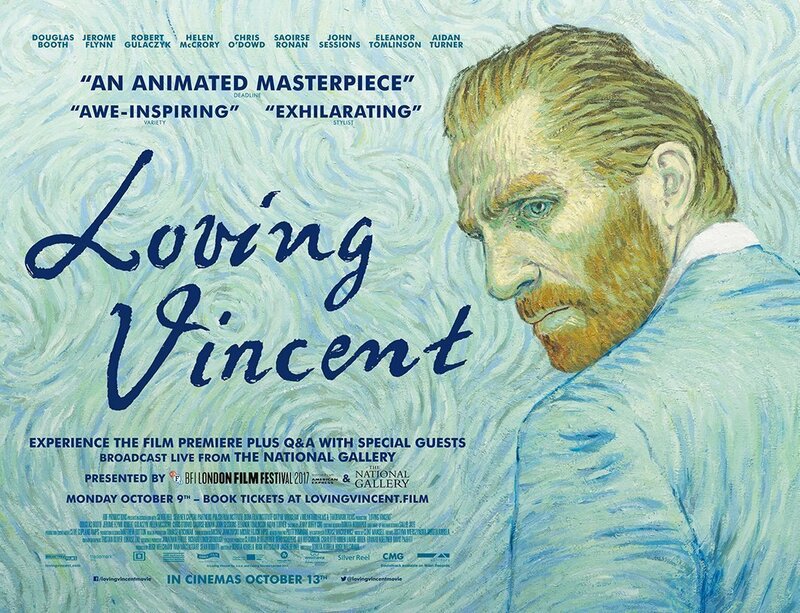 Over 125 animator-painters worked on Loving Vincent which features approximately 65000 individual paintings. The production, which was based in Poland, was not straightforward and was delayed several times as its investors balked at the experimental nature of the project and although it took longer than expected to secure funding the film’s intended release date stayed the same throughout. With pressure mounting production slowed further when the pool of classically trained painters in Poland began to dry up so the producers decided they needed to look abroad for more artists to meet their schedule. A recruitment trailer was released online which went viral with over 200 million views resulting in 5000 applications from around the world. Successful candidates were then invited for tests and then 18 days of training during which they had to master both van Gogh’s style and the animation techniques involved. Welchman and Kobiela read virtually all that’s been written about van Gogh for the purposes of research and even responded to new revelations during filming. The book Van Gogh’s Ear, released in 2016, almost conclusively proved that he cut off his entire ear, rather than just a part of it, and they repainted around 3,000 frames of the film to reflect the discovery. Only a fraction of the hand-painted frames survived the filming process, 1,000 out of the 65,000 created, and an exhibition of 200 of the paintings has just ended in the Netherlands whilst the other 800 paintings are being sold online for between £3000 to £8000. So should you like what you see this evening you can buy some of them! Around a third of the audience filled in and returned a feedback form. The majority of scores were 5s. There were a number of lower scores, a few 3s that could be counted on one hand and 4s that could be counted on both hands. At the lower end of the responses one respondent noted that for them the film was “rather too long”. Another was put off by the “constantly moving landscapes” preferring the black and white flashback scenes. Moving up the scores, many of the 4 scores commented on the way the film had been done, “wonderful graphics in the style of van Gogh – great reproduction of his colours” and “beautiful to look at. Excellent idea, well executed” were comments typical of responses at this score level and of those respondents giving it a 5 score. One respondent caveated that there had been “too much blood”. There were several comments, at all score levels, that the end credits had run through too quickly to allow them to be read properly. For many of those giving it a 5 score, this story of an investigation into the life of Vincent van Gogh, with a focus on his last days, was both illuminating and affecting. One respondent characterised it as, “mesmerising, tender, so terribly sad”. This feeling as to the emotional experience at watching the film was also reported by others. As with the 4 scores, there were very many comments at this level as to the film’s technical sophistication and the sheer amount of painstaking work that had gone in making it. “Beautiful”, “excellent” and “technically brilliant” were the type of comments made returned. For some respondents there was a depth of reaction to seeing the film that would clearly stay with them, “much food for thought” and “engrossing – challenging – absorbing. Well worth the concentration to comprehend”. Monday 8th January, ODEON Cinema. Start time: 8:00 p.m.
Cert. 15, 107 mins. 2017. This is a film whose title does what it says on the tin. 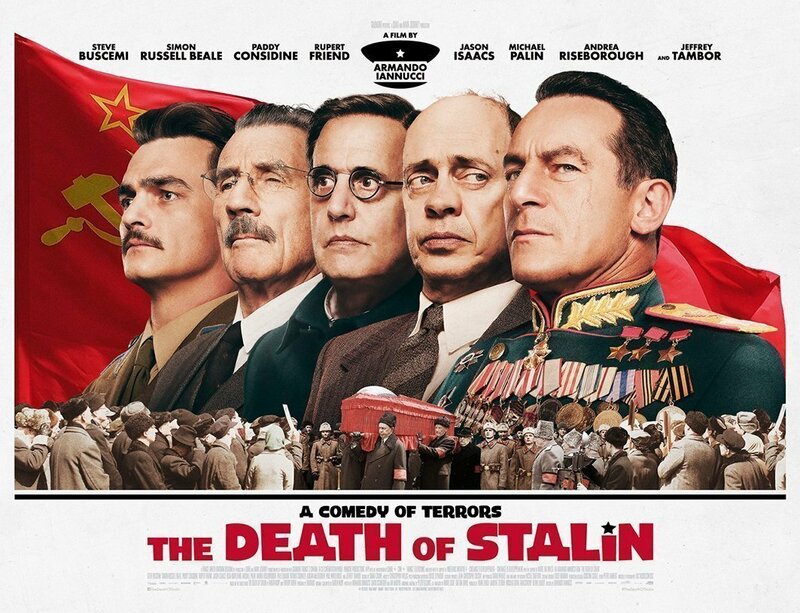 It covers the circumstances of Stalin’s death and the resulting politics within his inner circle during the immediate days following. It was a fearful time, and what I’m going to do in the next couple of minutes is to attempt to suggest why this was. Joseph Stalin died in March 1953 after being in sole charge of the Soviet Union for a full quarter of a century. That’s “sole charge” with ALL letters in capitals. Think, Robert Mugabe in charge of North Korea. And then turn the killing up to 11. By the time of his death, Stalin had slaughtered up to 30 million of his own people in the Purges of the 1930s and following. This included most of the top and middle-ranking officers of the Red Army. So, when the Germans attacked in June 1941 it took the Red Army about 2 years to re-professionalise and turn the tide on the Eastern Front. After 1945 Stalin cranked up control once more and when he died, he was in process of unleashing a new purge centred on the medical profession. This fear engendered by Stalin cannot be overestimated. Even if they were close to Stalin personally, nobody believed they were safe. When he sent a squad of Security Police to guard his mother, she saw them arrive and promptly fainted in terror. She thought her son had sent them to arrest her. For most people living under Stalin, there was only the fear. That’s the background of this film and the dynamic that informs and drives the actions of the characters as it did the real life players back in 1953. Thank you for listening so kindly. Let’s all watch the film. About a quarter of the audience returned a feedback form. Of those forms returned, one third gave it a 4 score and two-thirds gave it a 5 score. There were also 2 individual lower scores of 1 and 2. The respondent giving it a 1 explained their reaction as “Having been too near the reality” and felt this response derived from personal upbringing. The other lowest score, the 2, was formed on the basis that they did not find it funny, “Joking about such an awful period did not work for me”. Both the 4 and 5 score returns focused around the duality of the humour and the serious nature of the events and subject depicted. “Gripping – but comic?”, “Gritty & Comical – Odd combination but enjoyable”, “Excellent mix of humour and history” and “Funny, enthralling but so ‘evil’“, were representative of the comments handed in. There were many comments about the technical quality of the film itself and the performances given by the cast. These were overwhelmingly positive. “Totally riveting. Superb casting, acting, camera + sound”, “superb script, not a wasted word”, “Camera movements exquisite. Really felt I was actually embarrassingly THERE as part of the scene – almost unwillingly”. Monday 11th December, ODEON Cinema. Start time: 8:00 p.m.
Cert. Parental Guidance, 72 mins. Language: None, 2017. 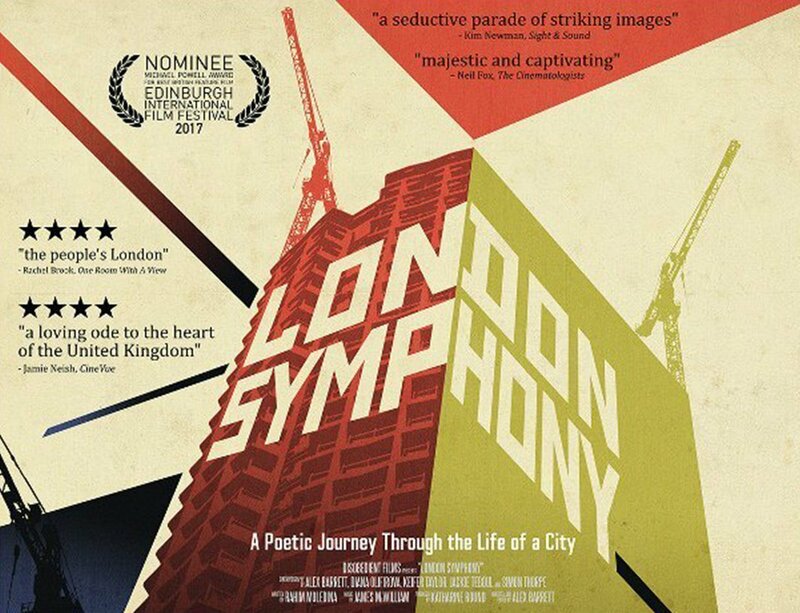 The film you are about to see is a city symphony. For those of you that don’t know, the city symphony is a genre of film that was predominately around during the 1920s. Essentially, they were creative documentaries that sought to capture the essence of a given city, and which also serve as time capsules for the era in which they were made. With this in mind, we thought it might be interesting to create a new city symphony, in the style of a film from the 1920s, to help shine a light on life today through the lens of the past. By deliberately evoking the films of the 1920s, we hope to help explore life today, and to look at the way that life has changed in the last 90 years, in much the same way as a historian would look to the past to help make sense of the present. The film was shot in over 300 locations around every borough of London, so hopefully there will be some places that you recognise, as well as many that you don’t. About half the audience filled in and returned a Feedback form. Two-thirds of those forms returned gave a score of 5 and the other third was split equally between scores of 3 and 4. Even the 3s were positive in general although one respondent confessed to “nodding off in the second movement” and a second felt part of the music, the “’staccato cello’ [was] a bit over-used”. Those giving it a 5 score were enthusiastic in their comments. “A wonderful piece of art!, “A fascinating and beautiful film”, “Mesmerising” and “it made me want to live there” captured the sense of how individuals in the audience responded to it. Several viewers made comment on the helpfulness of having the Q + A session after the film. This enabled them to deepen their awareness of the film they had just seen by understanding the concept behind the work and then the actual mechanics of how the film had been structured and then physically made. One member “needed the Q & A to explain certain things” and “would enjoy it more now, having heard the answers to all the questions”. Monday 13th November, ODEON Cinema. Start time: 8:00 p.m.
Cert. 12A, 116 mins. 2016. The director of this film, Aisling Walsh, described the artist Maud Lewis’ biography as “a very Canadian story, a very Nova Scotian story”. We should put that aside because the film was actually shot in Newfoundland, not in Nova Scotia. The film ran into funding issues so went to Newfoundland which caused some regional controversy. Maud Lewis was born Maud Dowley on March 7, 1903 in South Ohio, Nova Scotia, and suffered from juvenile rheumatoid arthritis. Living in poverty for most of her life, Lewis sold her paintings from her small home near Digby, N.S., for as little as $2 and $3. She achieved national attention through an article in 1964 when the Canadian magazine Star Weekly who described Lewis, then 62, as “Canada’s Grandma Moses” under the banner headline “The Little Old Lady Who Paints Pretty Pictures”, and she was also featured in a CBC TV documentary. Two of her paintings were ordered by the White House during Richard Nixon’s presidency in the 1970s. Although this film has brought about a resurgence in interest in the artist’s work this isn’t the first time she’s been reappraised. She was the subject of an acclaimed book, The Illuminated Life of Maud Lewis, and three National Film Board of Canada documentaries in 1976, 1998 and one in 2005 in which a group of Grade 6 students are inspired by Lewis’ work to create their own folk art painting. In 2009, there was a one-woman play named A Happy Heart about Lewis’ life. The renaissance of Lewis’ work aided by the film doesn’t look like stopping. Lewis’s paintings have sold for up to £13,000 but a recently discovered Lewis original, found at a thrift shop in New Hamburg, Ontario, titled Portrait of Eddie Barnes and Ed Murphy, Lobster Fishermen, Bay View, N.S. sold for CA$45,000 (£34,000) in an online auction in May of this year — almost three times its estimated price. Not everyone has been so lucky though, several people contacted the film’s crew and turned up at the production office claiming they had Maudie paintings – all proved to be fakes. But, given how prolific Lewis was, the film’s director believes it’s likely there are other undiscovered works of art still out there. “I think there’s still a lot still to be discovered. She painted at least one painting a day, if not two,” said Walsh. About half the audience filled in and returned a Feedback form. This film had been a real hit with the overwhelming mass of the audience. Most people had given it a score of 5 with a scattering of 4s. Whether scored 4 or 5, comments had been extremely positive. Terms such as “wonderful”, “brilliant”, and “excellent” were included in many responses. 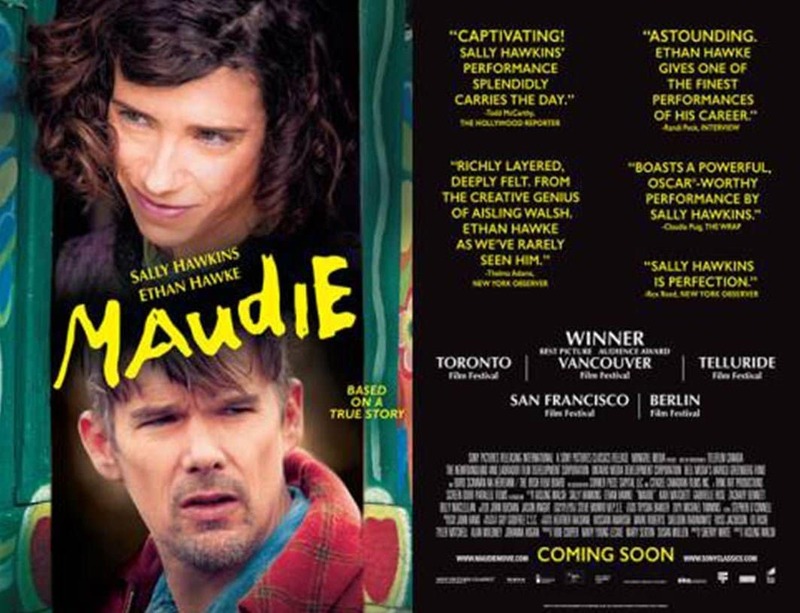 The stand-out performance of lead actress Sally Hawkins’s as Maudie was praised by many in their comments. All in all, from written comments and those spoken on the night, it is plain that people felt they had been more than simply entertained, they had gained emotionally from the experience. Monday 9th October, ODEON Cinema, Andover. Start time: 8:00 p.m.
Cert. 12A, 103 mins. 2016. 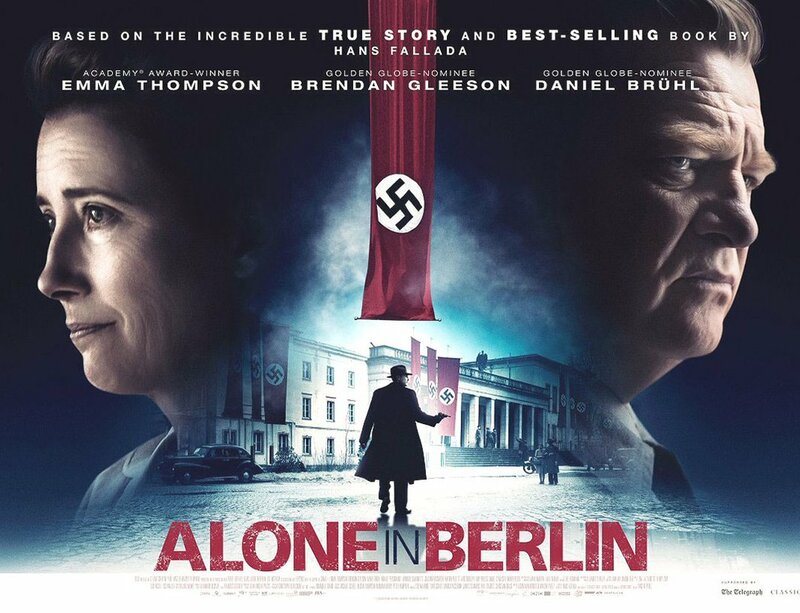 Alone in Berlin, this film does what it says on the tin. This film is about courage, that raw and cold-blooded kind of courage which only comes from an equally cold-blooded decision of the will. It’s about standing against the darkness and knowing that the darkness will eventually win – and then standing against it anyway. Lead actors Brendan Gleeson and Emma Thompson play husband and wife Otto and Anna Quangel. It’s wartime Berlin, 1940, and they are loyal supporters of the Nazi regime. Their son is serving with the German Army in the campaign against France. Their son is killed in action and this causes them to turn against the regime. They begin to leave cards denouncing the regime in public places. Nicknamed the “Hobgoblin” by the pursuing Nazi Police authorities, Otto and Anna manage to evade capture until the middle of the War. Once caught, their eventual fate, well, no real surprises there. So, what then did they achieve – a few cards opposing the regime? What was the point? Did it matter? As much as the Army Officers that tried to blow up Hitler in July 1944, Otto and Anna Quangel are heroes and should be honoured as such. It’s a personal view, but watching this film tonight I reckon we are doing just that. Just over half the audience filled in and returned a Feedback form. Two-thirds of those forms returned gave a score of 5 and the other third was split between scores of 2, 3 and 4. At the lower score end of the responses there were comments that it was a, “lightweight story line: stereotypical characterisation” and “…went on a bit”. Based on the real life resistance of a Berlin couple to the Nazis and adapted from a novel about their experience and fate, those individuals whom had read the book thought it a very good adaptation. The acting of the leads (Brendan Gleeson and Emma Thompson) was praised by all, whatever score they had given the film. Throughout the range of scores there were several comments that the Introduction to the film had given away too much of the plot and especially the ending. Monday 11th September, ODEON Cinema, Andover. Start time: 8:00 p.m.
Cert. PG, 80 mins. Language: None, 2016. The Red Turtle’s writer and director Michael Dudok de Wit was born in the Netherlands in 1953 and for his further education travelled abroad where he graduated from the West Surrey College of Art & Design in 1978. After working for a year in Barcelona, he settled in London where he directed and animated a number of award-winning commercials for television and cinema. In 1994 he created The Monk and the Fish which was nominated for an Oscar and he won an Oscar for Father and Daughter in 2000. In 2006, he made the short film The Aroma of Tea, which was drawn entirely with tea. After Hayao Miyazaki, the co-founder of Japan’s Studio Ghibli and writer/director of our 2014 season premiere film The Wind Rises, saw Father and Daughter he asked a producer friend to find its director with the prospect of working with him. De Wit said that, ‘It was unbelievable,’ and ‘it took me months to come down’ after a letter from Studio Ghibli arrived in 2006 to ask him to work on a project. 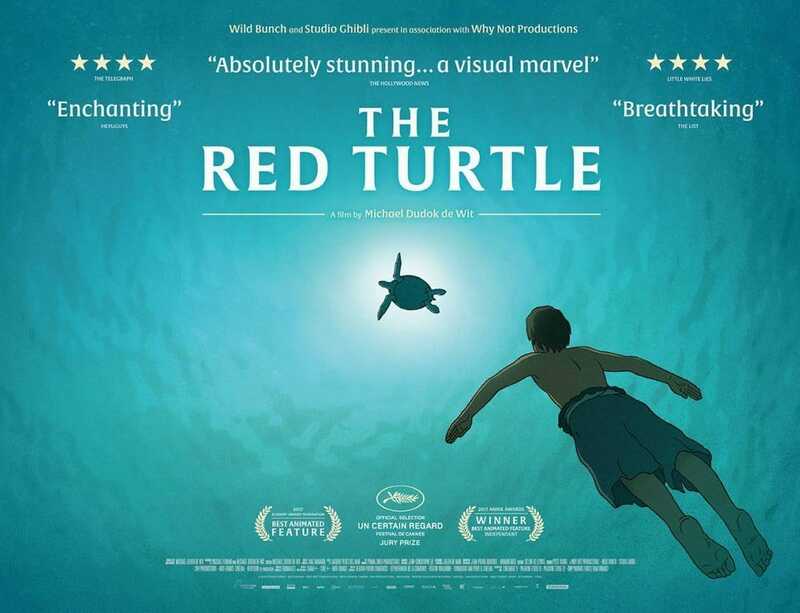 The Red Turtle began its life in his shed in north London but after four years of development and numerous visits to Tokyo he moved the project to some proper studios in Paris and 9 years after starting the film it was released to much acclaim last year. De Wit said he felt no pressure from Studio Ghibli, ‘On the contrary,’ he said, ‘the producers asked me to propose a story and a visual style.’ And true to the Ghibli style they let the director have the final say artistically. ‘I would often meet them and they expressed their opinions with frankness, but they didn’t impose changes,’ he said. Whether it works for us we shall find out in a moment! All in all, this was not a film that left people indifferent. Those seeing this film were clearly entranced by its look and feel, especially with the quality of the animation. Just under half of the auditorium responded with feedback. There was an equal division of 4s and 5s and three lower scores; one of 1 (“The music was nice”) and two of 2 (“Some nice visuals but felt like a short film padded out”). In both the 4s and 5s, descriptions of the film as “wonderful”, “beautiful” and “lovely” ran through many of the comments. Individuals were emotionally moved in various ways with what was happening to the characters on the screen. Terms such as “gripping”, “haunting” and “very gentle” were used. One comment nominated the crabs for best supporting actors dramatically. Two viewers observed that the entire audience had been completely quiet during the whole of the film indicating the hold exerted by it on everybody watching. There was a range of opinions expressed as to the film’s meaning. There were a number of views on this, including uncertainty on this score by some that it had any. General comments about the film ranged from “deep” and “thought provoking” to others feeling it “confusing” and “unresolved”. To some, the film touched on the wider world, from, “a good example of how nature always prevails” to the specifics of the human condition, “Thoughts of being alone & survival/the joys of love & family”.